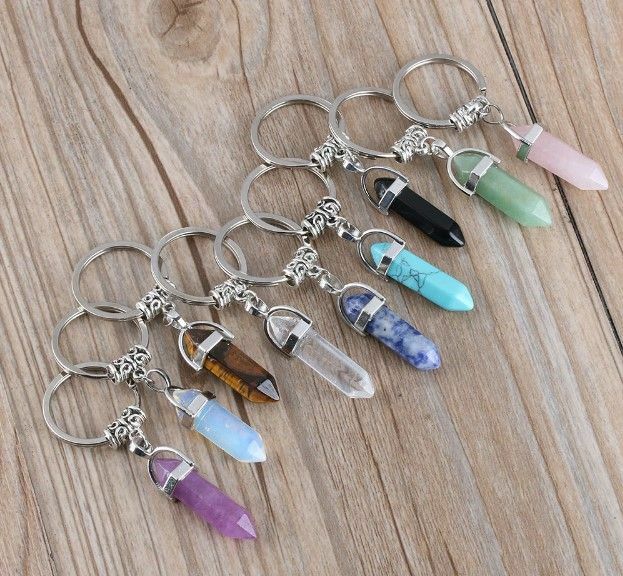 Natural Stone Keychain Turquoise Pink Opal Amethyst Crystal Key Chains rings Fashion Accessories Material: Alloy+ Natural stone Plating: Antic sliver Color: As the picture shown Quantity: 1 pc (With Key ring) Package: PP bag The best gift to relatives and friends. Shape: Drip Length: 30mm-35mm Weight: About 7g-15g About Natural Stone: Due to natural stone be made by nature, so it is such an abnormal phenomenon that Crack and cotton wadding exist. 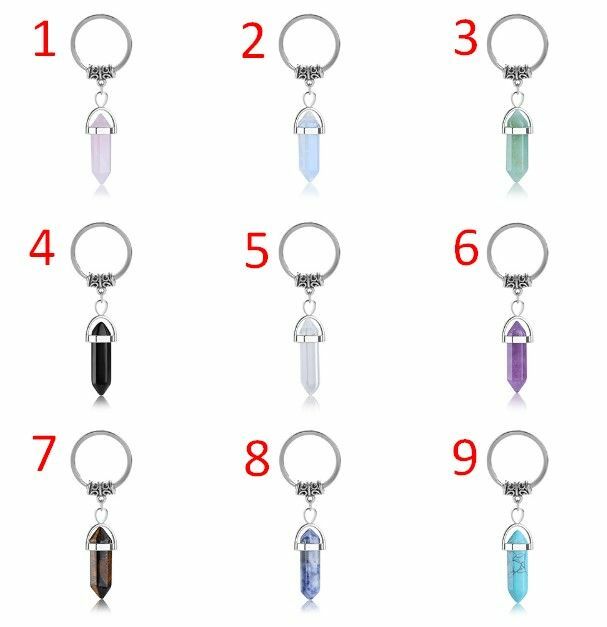 Package: 1pc Natural Stone Keyring Note: Please allow errors of the color from different monitors and the measure by hands. Gemstones with Health Benefits by International Gem Society In ancient Egypt and other cultures from antiquity, people believed gemstones had a wide array of health benefits. In modern times, gemstones are mainly used for ornamental purposes. However, some people still believe you can receive health bonuses from certain gemstones and minerals. Some use gemstones as part of their spiritual practices to restore energy fields, gain peace, and promote love and safety. In some belief systems, gemstones are placed on certain areas of the body, called “chakras,” to promote healing. In other systems, gaining health benefits from gemstones can be as simple as wearing a piece of jewelry made with a specific gem. Rose Quartz A popular gemstone, the pink-hued rose quartz is said to help heal heartaches. Closely associated with love, the rose quartz seems to have a soothing, gentle energy that can calm an agitated wearer. To get the most benefit from a rose quartz, wear the gemstone on a pendant around your neck. This allows the stone to stay close to your heart and help close emotional wounds, promote self-love, and keep your heart open to positive relationships. A gift of a rose quartz can be a wonderful message to someone going though a divorce, breakup, family estrangement, or any struggle with loneliness and lack of inner peace. Garnet The gorgeous, deep shades of red in the garnet are said to energize wearers, which could help them deal with health issues. Wear garnet to give your whole system a boost, revitalize your body, and promote your emotional well-being by boosting your confidence. The stone is also said to bring protection from evil and bad karma. Wear your garnet anywhere, but near the heart is said to be optimal. Amethyst A gorgeous purple gemstone, the amethyst is said to bring strength, courage, and peace to the wearer. These benefits can help promote healing. It’s a soothing stone with peaceful properties, with a quiet energy that should also help release creativity. Since the stone has such tranquil qualities, it’s a great gift for anyone suffering from anxiety, mood disorders, and addictions. Wear it anywhere to promote spiritual and physical health. Pearl A beautiful pearl occurs naturally inside an oyster and can come in many shades, shapes, and sizes. Pearls are said to balance the entire body and create positive, happy feelings within the wearer. In traditional Asian medicinal systems, pearls have been used for treating ailing digestive systems, fertility issues, and heart problems. Today, pearl powder is used in makeup to achieve a glowing complexion. Some people believe it can also be used to treat many skin disorders such as rosacea. Moonstone The hauntingly beautiful, white, clear, or rainbow colored moonstone is said to help wearers achieve balance, particularly females. Since ancient times, travelers have used this gemstone as a protective talisman. Moonstone jewelry has been used to alleviate anxiety, depression, insomnia, and to promote creativity. Some believe this gemstone can also help combat the ailments of both old age and childhood. Amber Yellow, brown, or red colored amber is believed by some to be a powerful gemstone with uses ranging from treating headaches and stress to promoting self-expression. It’s also said to promote cleansing and purification, which may help to bring illnesses out of the body and alleviate pain so that the wearer can heal. Citrine Citrine is said to promote emotional well-being and increase positive energy. Some believe it can help with hearing difficulties, digestive ailments, sleep problems, and pain and inflammation management. Wear citrine in its natural form if at all possible to enhance its positive benefits. Aquamarine The color of the ocean, glittering aquamarine is one of the most beautiful gemstones you can buy. There are many traditional beliefs connected to this gem. Aquamarine has been said to help with digestive, eye, and teeth problems. In the past, sailors often used aquamarines to bring them luck at sea. Some still use the stone today for protection purposes. 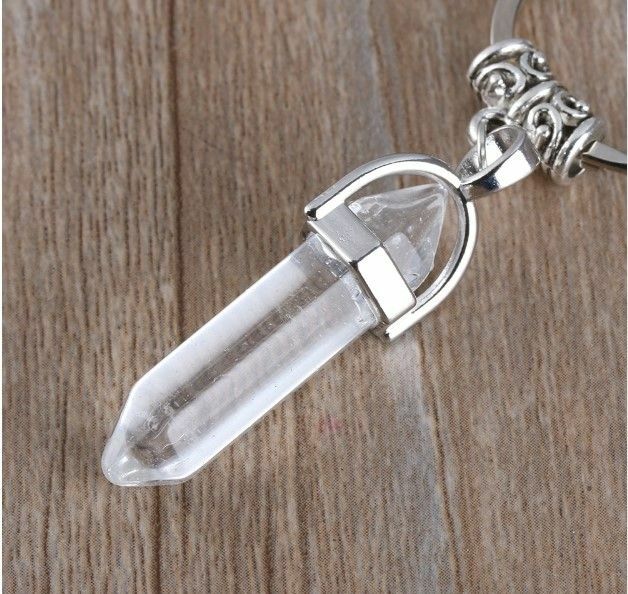 The stone is said to be a positive force that can bring happiness to its wearer and help cope with the grieving process. Some people believe the aquamarine promotes healing energy, reduces the fear of water, and can even bring a wayward lover back. Some shamans use it as a meditative stone. Estimated Delivery Time:15-45 days (ships out within 10 business days). Factors such as holidays, delayed logistics and customs clearings may have an impact on the delivery time. We are not responsible for local customs charges and any other charge. We DO NOT deliver to Kosovo and BiH. Thanks for shopping at Goldie.store . 1. If the order is under $25, do not expect the tracking information to be reliable. At that point, the tracking number only serves as proof that the package has been sent. 2. The deadline for any complaints about the product (including if it arrived or not) is 2 months and 15 days after ordering. After that period, every order will be treated as completed. Any complaints after that point will not be considered. 3. In the case that the customer does not accept or pick up the package after the first attempt of delivery, we are not held responsible, and will not give any refunds or resend the package. You have 7 days to return an item from the date you received it. 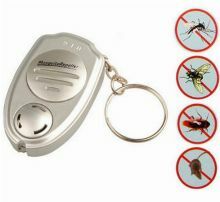 The best gift to relatives and friends. About Natural Stone: Due to natural stone be made by nature, so it is such an abnormal phenomenon that Crack and cotton wadding exist. Please allow errors of the color from different monitors and the measure by hands. In ancient Egypt and other cultures from antiquity, people believed gemstones had a wide array of health benefits. In modern times, gemstones are mainly used for ornamental purposes. However, some people still believe you can receive health bonuses from certain gemstones and minerals. Some use gemstones as part of their spiritual practices to restore energy fields, gain peace, and promote love and safety. In some belief systems, gemstones are placed on certain areas of the body, called “chakras,” to promote healing. In other systems, gaining health benefits from gemstones can be as simple as wearing a piece of jewelry made with a specific gem. A popular gemstone, the pink-hued rose quartz is said to help heal heartaches. Closely associated with love, the rose quartz seems to have a soothing, gentle energy that can calm an agitated wearer. To get the most benefit from a rose quartz, wear the gemstone on a pendant around your neck. This allows the stone to stay close to your heart and help close emotional wounds, promote self-love, and keep your heart open to positive relationships. A gift of a rose quartz can be a wonderful message to someone going though a divorce, breakup, family estrangement, or any struggle with loneliness and lack of inner peace. The gorgeous, deep shades of red in the garnet are said to energize wearers, which could help them deal with health issues. Wear garnet to give your whole system a boost, revitalize your body, and promote your emotional well-being by boosting your confidence. The stone is also said to bring protection from evil and bad karma. Wear your garnet anywhere, but near the heart is said to be optimal. A gorgeous purple gemstone, the amethyst is said to bring strength, courage, and peace to the wearer. These benefits can help promote healing. It’s a soothing stone with peaceful properties, with a quiet energy that should also help release creativity. Since the stone has such tranquil qualities, it’s a great gift for anyone suffering from anxiety, mood disorders, and addictions. Wear it anywhere to promote spiritual and physical health. A beautiful pearl occurs naturally inside an oyster and can come in many shades, shapes, and sizes. Pearls are said to balance the entire body and create positive, happy feelings within the wearer. In traditional Asian medicinal systems, pearls have been used for treating ailing digestive systems, fertility issues, and heart problems. Today, pearl powder is used in makeup to achieve a glowing complexion. Some people believe it can also be used to treat many skin disorders such as rosacea. The hauntingly beautiful, white, clear, or rainbow colored moonstone is said to help wearers achieve balance, particularly females. Since ancient times, travelers have used this gemstone as a protective talisman. Moonstone jewelry has been used to alleviate anxiety, depression, insomnia, and to promote creativity. Some believe this gemstone can also help combat the ailments of both old age and childhood. Yellow, brown, or red colored amber is believed by some to be a powerful gemstone with uses ranging from treating headaches and stress to promoting self-expression. It’s also said to promote cleansing and purification, which may help to bring illnesses out of the body and alleviate pain so that the wearer can heal. Citrine is said to promote emotional well-being and increase positive energy. Some believe it can help with hearing difficulties, digestive ailments, sleep problems, and pain and inflammation management. Wear citrine in its natural form if at all possible to enhance its positive benefits. The color of the ocean, glittering aquamarine is one of the most beautiful gemstones you can buy. There are many traditional beliefs connected to this gem. Aquamarine has been said to help with digestive, eye, and teeth problems. In the past, sailors often used aquamarines to bring them luck at sea. Some still use the stone today for protection purposes. The stone is said to be a positive force that can bring happiness to its wearer and help cope with the grieving process. Some people believe the aquamarine promotes healing energy, reduces the fear of water, and can even bring a wayward lover back. Some shamans use it as a meditative stone.